This is your last morning as a single lady. This is a time to celebrate who you are, who you've become, and the amazing ladies who've watched and even helped shape that process over the course of your life. Which, leads us to our first tip! Honestly, this part should be really easy. Because it's highly likely that your favorite ladies are already in your bridal party and will be getting ready with you. But even if you've chosen not to have a bridal party, coming up with this list shouldn't take any effort. Who is in your Recent Calls list? What friends are all over your Facebook timeline? Who have your co-workers heard about and now know by name even though they've never met? Or...my favorite one: What ladies will CELEBRATE with you the most? 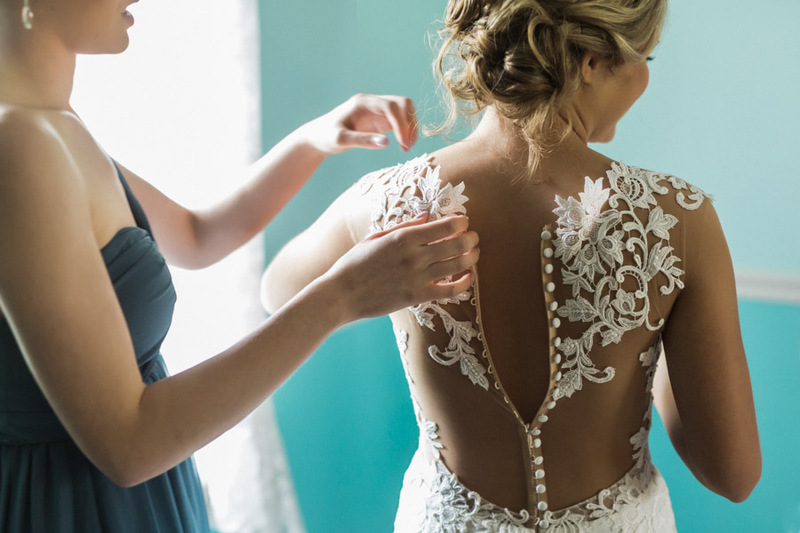 You'll want these ladies to be the ones that make you laugh (so hard that you cry), that will shed tears of joy when they see you in your dress. The friends that will, "Remember when" all morning as you tell hysterical stories of your growing up or dating your fiance. All of these things will relax you, and keep you focused on what the day is all about: marrying the man of your dreams! A small word of caution, that while you definitely don't want to feel like anyone is missing from this special group you choose, brides can tend to feel a bit overwhelmed when there's more than about 12-15 people around giving suggestions about the wedding day or your hair/makeup. (For some brides, that number is more like 3-5.) You know yourself, you know your friends-- just consider the space you have and what will help keep you sane, stress-free, and relaxed. This is where the party starts! Mimosas, the best coffee, pastries and fruit...or even a full-on brunch! Don't skimp-- this is the greatest day ever, after all! From a practical standpoint, it wouldn't be a bad idea to have a designated bridesmaid who makes sure you're eating and drinking enough (water!) on your wedding day. Staying hydrated and nourished is so.so. important for all of the emotions and energy needed to greet guests and pour out your heart in front of a hundred people. We recommend having plenty of space for ladies to hang out as you sip those mimosas and chat with one another while they're not in our styling chairs. Consider whether you'd feel more comfortable in a perfectly-naturally-lit hotel room + a front desk to call for any needs, or if the familiar space of your childhood home would put you right at ease, do what's best for you. We will just add, that bridal parties who have only one or two locations to be at for the day, seem a lot less frazzled. 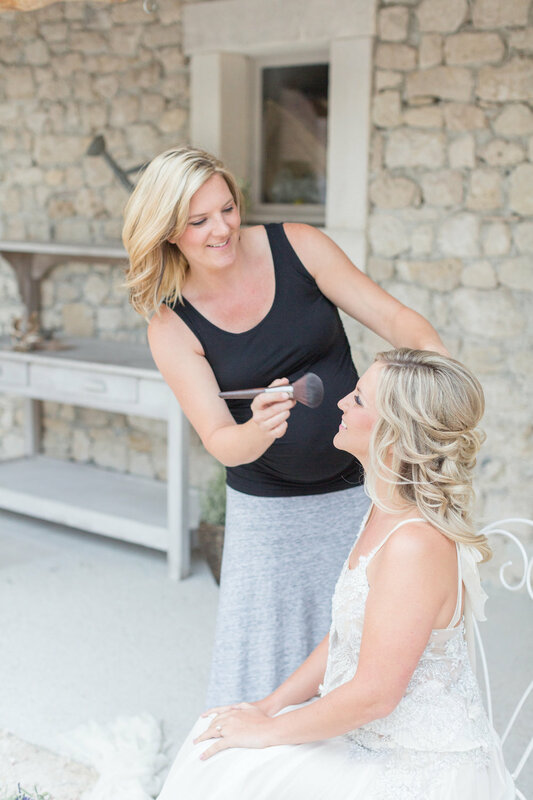 Whether you get ready at the ceremony site or reception venue (or both), we've seen a significant decrease in the stress of ladies as they transition from one part of the day to the next, if the final wedding-destination is all in the same place, or just one additional location. 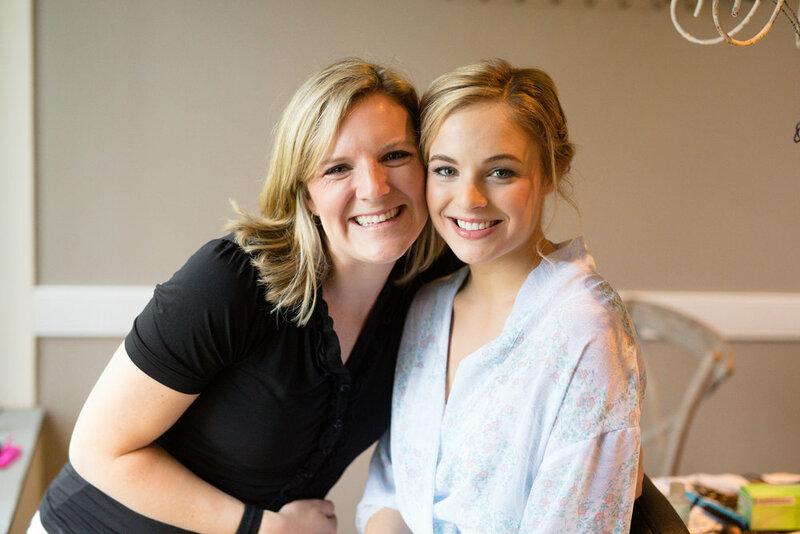 One of many reasons we love getting to know our brides personally, is because after our phone calls, countless emails, a trial run, and Pinterest Board sharing together, we are a familiar face, and calming presence to a bride on the morning of her wedding. We love knowing our brides' likes and dislikes, and being able to focus all of our energy and attention in the right place on her most important day. We are a no-drama, positive, energetic team who absolutely LOVES what we do! ...or a Wedding Coordinator to take care of it! Honestly, though, we see this as a huge area of stress for brides. Any last minute things that need to be handled the day of the wedding often keep them distracted from being in the moment and savoring every single second of this day they've planned so long and hard for. Pass the to-dos onto someone else: brides are just supposed to ENJOY!! Thank you, Lauren Fair Photography and Kristin Shyla for these gorgeous images! Choosing your wedding hair and makeup look isn't a small decision. It significantly impacts your confidence for the day, every SINGLE photo, and how you'll remember feeling about yourself as you reflect back and reminisce about the most important day in your life for the rest of forever. ...the truth is, on your wedding day, you don't want to just look pretty. You want to look YOUR BEST. Recognizably YOU...the very best representation of you. A look that encapsulates who you are, your style, your personality, and puts it on display for the world to see! You want to look and feel the most comfortable you've ever felt in your own skin. This requires finding a hairstylist and makeup artist who will take the time to get to know you. Check out our guest post on Style Me Prettyfor more tips about How to Look Like Yourself on Your Big Day. Sure, face structure, hair texture, density, eye setting, etc. can "tend" towards looking better in certain ways. But unless a hairstyle or makeup look is representative of YOU...you won't like it, or feel comfortable in it. Or, there could be other styles you like far better, and you just have no idea they even exist. Here's an example. This gorgeous bride is named Brooke. Chances are, you don't know her. So every reader will have a different opinion about what hair and makeup styles look best on her (trust us- we've heard them all!) And that's because...well, she's beautiful! She looks gorgeous in all of the styles! But to those who know her best, there is only one that's "Brooke." While Brooke could pull off any of these looks: the flower crown Taylor Swift look-alike, the Icelandic princess, the timeless, vintage, re-purpose-your-mom's-dress look...what's most "her", fit HER personality, HER style, and complimented HER wedding gown...was soft, natural, beautiful waves in her flowing long blonde hair. Just look at how her face lights up as she feels so comfortable in this look! She's glowing! All of this is why a Trial Run is so important. In the process of getting to know you, we like to be able to offer helpful tips, suggestions, recommendations, and style ideas you may have never seen before or thought of that might be just PERFECT for you. A special thanks to Cheryl Dawn Photography for the amazing images from Brooke's stylized photo shoot/trial run, and M2 Photography for these breathtaking photos of Brooks' wedding day. We are honored to work with you both!